Tag Archive | "Core i7-3667U"
In a typical ‘premium first’ move, Intel have announced 4 new 3rd generation Core processors aimed at Ultrabooks and other highly mobile PCs. It’s easy to see which devices are going to be best for gaming and video work – the i5-3317U runs a slightly lower max GPU clock. All have a 17W nominal TDP although we already know that this TDP can be programmed up or down for design purposes. 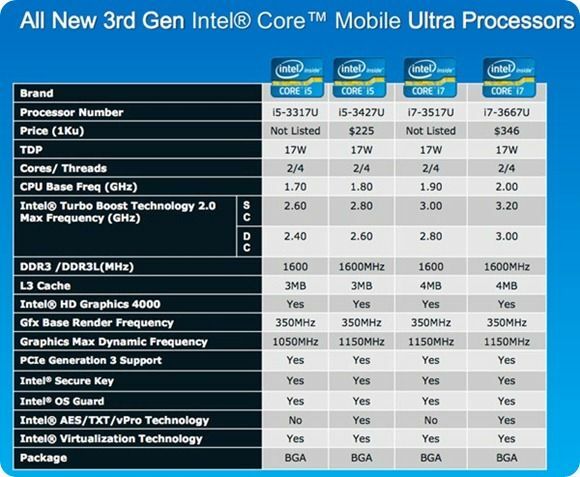 More Ultrabook Processors Revealed. Get ready for confusion! If you thought that tracking processors, clockrates and TDP figures was hard last year, just wait until later this year when ‘programmable TDP’ CPUs hit Ultrabooks. It looks like we’ll have to make a change to our product database to accommodate this new idea in multi-use CPUs. Despite Acer’s bullish proposals for an updated S3 ultrabook in April next year it looks like new Ultrabooks won’t start hitting shelves until the second half of 2012 but when they do, we can expect CPU and GPU clock boosts along with the extra goodness that’s going into the chipsets.